Purpose: To find out the prevalence of LBP among female caregivers of children with cerebral palsy (CP) and how it affects the ability of female caregivers to manage in everyday life. 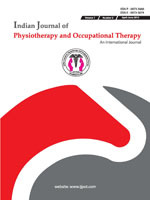 Objectives: The objectives were to estimate the prevalence of LBP of the last 12 months among female caregivers of CP; to determine the association between LBP of the last 12 months and demographic variables; and to explore the levels of physical disability of the female caregivers to manage in everyday life due to low back pain. Method and Measures: Cross sectional design was used. In this study, one question from the Standardized Nordic Questionnaire (SNQ) was used to estimate the prevalence of LBP of the last 12 months among female caregivers of CP, some demographic variables had been chosen to show association with LBP of the last 12 months, and the Oswestry Disability Index (ODI) version 2.1a was used to determine the levels of physical disability of the female caregivers to manage in everyday life due to LBP. Results: Among the seventy-five participants, mean age was 25.7(±5.6) years. More than half of the female caregivers (58.7%; n=44) engaged in their child (CP) care tasks for less than 6 hours per day. Most of the children with CP were spastic (82.7%; n=62) and quadriplegic (41.3%; n=31). In the female caregivers, the prevalence of LBP of the last 12 months was 66.70% (n=50). Relationship with the child with CP and family income were associated with LBP of last 12 months (p<0.005). Conclusion: The result shows high prevalence of LBP among the participants which requires ergonomic attention. Rapoport J, Jacobs P, Bell NR, Klarenbach S. Refining the measurement of the economic burden of chronic diseases in Canada. Chronic Dis Can. 2004 Winter;25(1):13-21. Lidgren L. The bone and joint decade 2000-2010. Bull World Health Organ. 2003;81(9):629. The Burden of Musculoskeletal Conditions at the Start of the New Millennium. Geneva, Switzerland: World Health Organization2003. Hoy D, Bain C, Williams G, March L, Brooks P, Blyth F, et al. A Systematic Review of the Global Prevalence of Low Back Pain. Arthritis & Rheumatism 2012;64(6):2028–37. Shakoor MA, Islam MA, Ullah MA, Ahmed MM, Hasan SA. Clinical profile of the patients with chronic low back pain- Astudy of 102 cases. Journal of Chittagong Medical College Teachers’ Association. 2007;18(2):16-20. Tong HC, Haig AJ, Nelson VS, Yamakawa KSJ, Kandala G, Shin KY. Low back pain in adult female caregivers of children with physical disabilities. Archives of Pediatrics and Adolescent Medicine. 2003;157(11):1128-33. Sanders MJ, Morse T. The ergonomics of caring for children: an exploratory study. Am J Occup Ther. 2005 May-Jun;59(3):285-95. Eicher PS, Batshaw ML. Cerebral palsy. Pediatr Clin North Am. 1993 Jun;40(3):537-51. Düger T, Yilmaz O, Aki E, Kayihan H, Karaduman A. The environmental barriers of children with Muscular Dystrophies and its effect on mother’s low back pain. Disabil Rehabil. 2003 Oct 21;25(20):1187-92. Bobinac A, Exel NJv, Rutten FF, Brouwer WB. Caring for and caring about: disentangling the caregiver effect and the family effect. J Health Econ. 2010 Jul;29(4):549-56. Kuorinka I, Jonsson B, Kilbom A, Vinterberg H, Biering-Sorensen F, Andersson G, et al. Standardised Nordic questionnaires for the analysis of musculoskeletal symptoms. Appl Ergon. 1987 Sep;18(3):233-7. Fairbank JC, Pynsent PB. The Oswestry Disability Index. Spine (Phila Pa 1976). 2000 Nov 15;25(22):2940-52; discussion 52. Dillon C, Paulose-Ram R, Hirsch R, Gu Q. Skeletal muscle relaxant use in the United States: data from the Third National Health and Nutrition Examination Survey (NHANES III). Spine (Phila Pa 1976). 2004;29(8):892-6. Tonga E, D¨uger Tu. Factors affecting low back pain in mothers who have disabled children. Journal of Back and Musculoskeletal Rehabilitation. 2008;21 219–26. Ehrlich GE. Low back pain. Bulletin of the World Health Organization 2003;81(9):671-6. Prior M, Grimmer-Somers K, Gibson S. validation of a unique measure of physical cerer demand in parents of physically disabled children- a pilot study. the internet journal of allied health sciences and practice. 2007;5(1):1-11. Smith BH, Elliott AM, Chambersa WA, Smith WC, Hannaford PC, Pennyb K. The impact of chronic pain in the community. Family Practice. 2001;18(3):292-9. Yip YB. The association between psychosocial work factors and future low back pain among nurses in Hong Kong: A prospective study. Psychology, Health and Medicine. 2002;7(2): 223-233. Strunin L, Boden LI. Family consequences of chronic back pain. Social Science & Medicine. 2004;58(7):1385-93. Kaya K, Unsal-Delialioglu S, Ordu-Gokkaya NK, Ozisler Z, Ergun N, Ozel S, et al. Musculo-skeletal pain, quality of life and depression in mothers of children with cerebral palsy. Disability and Rehabilitation. 2010;32(20):1666–72.